The week is filled with opportunities and activities for young rodeo athletes, including: two rodeo performances per day, shopping, scholarships, nightly dances, family cookouts, educational clinics and much more. The National High School Rodeo Association (NHSRA) is a youth-driven, family-friendly organization, and this was more apparent than ever this past week in the cowboy state. The National Reined Cow Horse Association (NRCHA) just completed its fourth year of partnership with the NHSRA. 101 contestants from all across the United States, Canada and Australia spent the week competing for the championship title in one of the largest youth reined cow horse classes in history. The cow horse excitement kicked-off on Saturday, July 14, with a free clinic sponsored by NRCHA cooperate partner CINCH. NRCHA Million Dollar Rider Jake Telford and top-notch NRCHA Professional Jason Gay, both of Caldwell, Idaho, spent the day educating and coaching the young cow horse enthusiasts. 50 clinic participants embraced their one-on-one time with the clinicians, while either working a cow or putting the finishing touches on their rein work. The contestants’ hard work and determination was evident, as they shined through each performance. The NHSFR is comprised of three go-rounds; first, second and then, the top twenty riders advance to the short-go, carrying their scores from the previous go-rounds. The improvement seen in these young competitors, and their horses, over the past four years was astounding. The judges rewarded their efforts with big scores right out of the gate. It took a score of 71 or better, across the board, to advance to the short-go. After four years of competing in the NHSRA reined cow horse, the Pilot Point, Texas, cowboy Josh Briggs finally captured the 2018 NHSFR Reined Cow Horse Championship with a composite score of 877. The 2018 graduate came into the short-go with a composite score of 589. Mother nature was not kind to Briggs; as he entered the outdoor arena, the wind picked up and dust started to fly. Briggs and his mount, Ricochet Shine (Ricochet San x Shiney Tea Pot Doc x Tejons Peppy Doc), battled against the weather and their cow, scoring a 288. 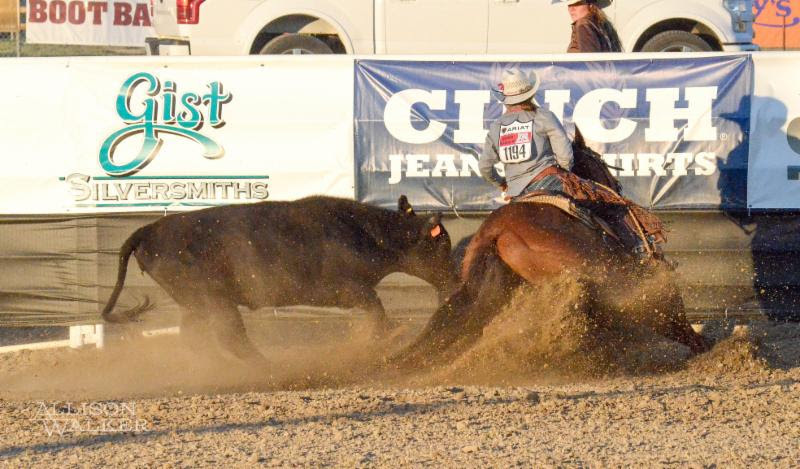 Briggs’ championship title was accompanied with romal reins from Traditional Rawhide Braiders and a $1,500 scholarship from the NRCHA Foundation, all in addition to the NHSFR awards. Briggs will be attending North Central Texas College this fall, where he will ride on the equestrian and ranch horse teams. Natalie Leisinger, Highmore, South Dakota, was crowned the 2018 NHSFR Reined Cow Horse Reserve Champion. Leisinger began her cow horse journey on a rope horse, when the event was first added to the NHSRA line-up. Four years ago, she fell going down the fence during the second go-round of the NHSFR in Rock Springs. The past few years of perseverance and persistence, to improve her horsemanship skills and horsepower, paid off as she finished second place in the same arena where she once faced challenges. Leisinger’s composite score of 874.5 (290.5 first go/288.5 second go/295.5 short-go) earned her a pair romal reins provided by Traditional Rawhide Braiders and NSHFR awards. We have not seen the last of this 2018 graduate; she will be attending Casper College this fall and continue her love of the sport by showing in the NRCHA. For the second year in a row, The Reining Horse Foundation (RHF), the philanthropic arm of the National Reining Horse Association (NRHA), provided a $1,500 scholarship and beautiful bronze trophy to the highest reining score of all three go-rounds. Josh Briggs, Pilot Point, Texas, and Brie Wells, LaMars, Iowa, tied for the win with a score of 149. The recipients will split the scholarship and each receive a trophy. A big fence work score of 152.5 landed Reece Ullerich, Humboltd, South Dakota, the highest cow work score of all three go-rounds, a $1,000 scholarship provided by the NRCHA Foundation and a Gist custom buckle. All top-twenty Finalists received an invitation to the 2018 NRCHA Celebration of Champions in Fort Worth, Texas, where they will compete in the High School Rodeo Challenge. It is with great pleasure, the NRCHA partnered with Goodness Knows and Pedigree as sponsors for the 2018 NHSRA reined cow horse event. The unwavering support from Goodness Knows and Pedigree is greatly appreciated and ensures continued growth and recognition of the reined cow horse. The increase in participation and high level of competition is directly connected to the constant effort of NRCHA Professionals and Members. Thank you to everyone who volunteers their time, livestock, facilities, and shares their knowledge with young cow horse enthusiasts. Your hard work and support does not go unnoticed and will pay dividends to the future of the sport we all love. 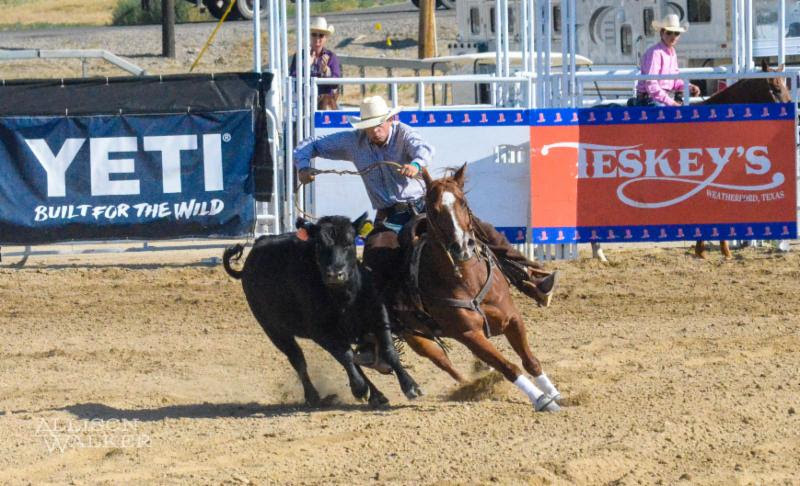 The 2019 National High School Finals Rodeo will return to Rock Springs, Wyoming, where we plan to see another stellar year of reined cow horse competition.